Hello an welcome to the 2nd gimp shorty. 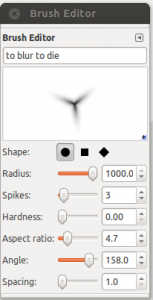 According to my first Post „GIMP Shorties: The magic of a gimp blur background“ we stay blurry ;), but we change the section a little bit. We do not talk about filter but brushes. Sometimes we need a really smooth, blurry brush for example to repair some parts of a Photo. 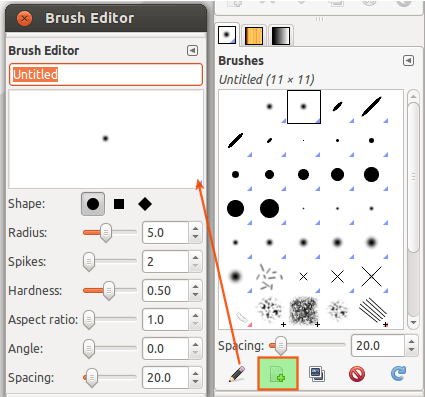 Gimp a has a nice default brush-selection, but i like to create my own brush because it is really simple. 1.) 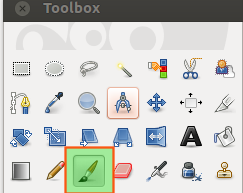 click on the paintbrush-symbol in the toolbar. 2.) 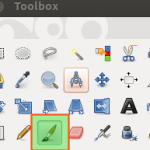 click on „New Brush“. The brush Editor will open and you can give the new brush a name. Hardness and Spacing. Both should be set to 0. Why? Because Spacing is responsible how smooth the brush works. If you set it greater 0, it would be really choppy. 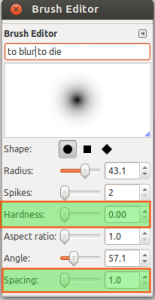 The Hardness-parameter is for the blur. It should be set to 0 too if you want it really blurry ;). For example, if you dont want a circle – set the aspect-ratio > 1. And if you add a Spike (set spike = 3), you have a nice brush of a spinning windmill-symbol. Sorry for not publishing an xfc-file, but in this tutorial it doesn’t make any sense :).